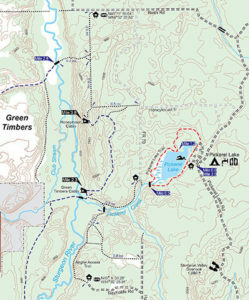 Green Timbers is a 6,300-acre slice of the state forest that is split by the Sturgeon River and laced by a trail system of more than 20 miles. Once the site of a company retreat, the state took over the property in 1983 and removed the cabins. But the sites of the old Honeymoon and Green Timbers Cabins are now popular places to spend a night. The former Honeymoon Cabin in Green Timbers. 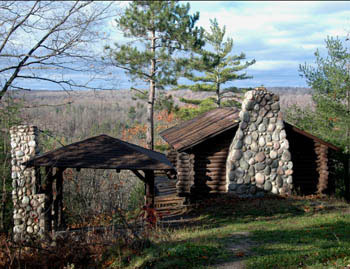 The Shingle Mill & Green Timbers map is part of the Classic Trails of Michigan series from MichiganTrailMaps.com. The large format map measures 11 by 17 inches, is printed on durable card stock and coated to be water resistant. Includes all distance markers, contour lines, historic buildings and ruins. Best of all, when folded it fits in your back pocket or the side pouch of your pack.